After you receive an AliExpress product order, you will need to purchase it from the supplier. Go to the Oberlo Orders page to place the order. If you do not see the order in Oberlo, check out this article for the possible causes. You have the Oberlo Chrome Extension installed and you are using a computer. You have an AliExpress account created and you are logged into it. Do not place orders as a guest because you won't be able to track them later, and your customer will receive emails from AliExpress. Make sure that your AliExpress cart is empty before placing a new order. 1. Click on the orange "Order Products" button to start the process. 2. You will be directed to the AliExpress website, where items and the shipping information will be added by Oberlo. If something is not added automatically, you will need to fill it in manually. 4. 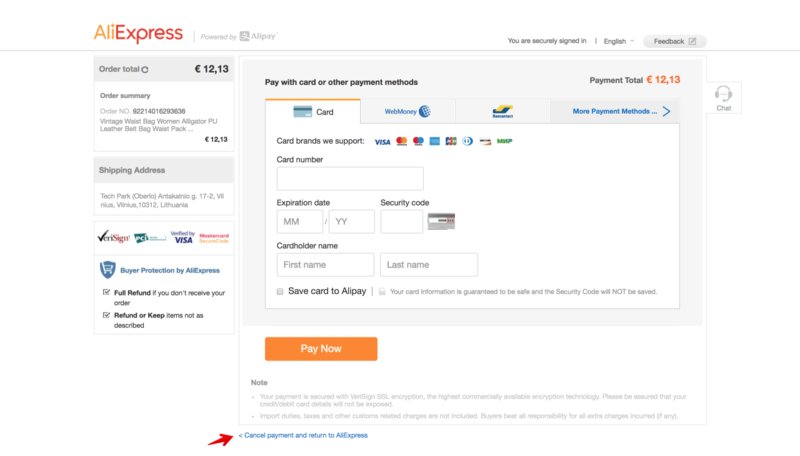 Choose "Other payment methods" and click "Confirm & Pay". By selecting this option, you will still be able to pay by debit / credit card. 5. Fill in your payment card details and click "Pay Now" to complete the purchase. If you want to place several orders under the one payment transaction, click on the "Cancel payment and return to AliExpress" button. 6. Go back to Oberlo , and place other orders following the same steps. Finally, once you want to pay for several orders, go to the "Awaiting payment" section and click on the "Pay for all orders" button. On the newly opened page, fill in your payment card details to complete the purchase. 7. 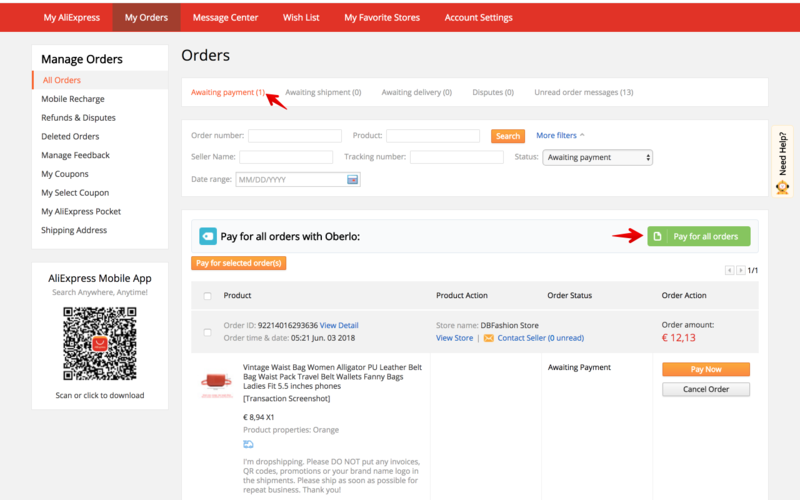 Once the supplier ships the order (within 2-7 days), use the Oberlo sync buttons to import the tracking code from AliExpress to your Oberlo and Shopify platforms. You can use the "Get Tracking Code" in Oberlo to achieve this. 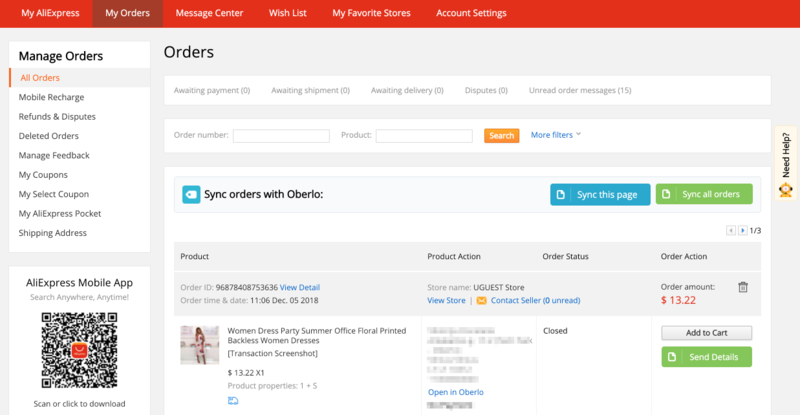 Otherwise, you can use the "Send Details", "Sync this page" or "Sync all orders" buttons on the AliExpress.com website. After this step, your order will be marked as fulfilled in Oberlo and Shopify. Why Do I See the "Place Order Manually" Button?